Healthcare and work wellness programs don’t usually conjure thoughts of teamwork, comic relief and personal breakthroughs. Kadalyst was doing something so different the market hardly understood it. 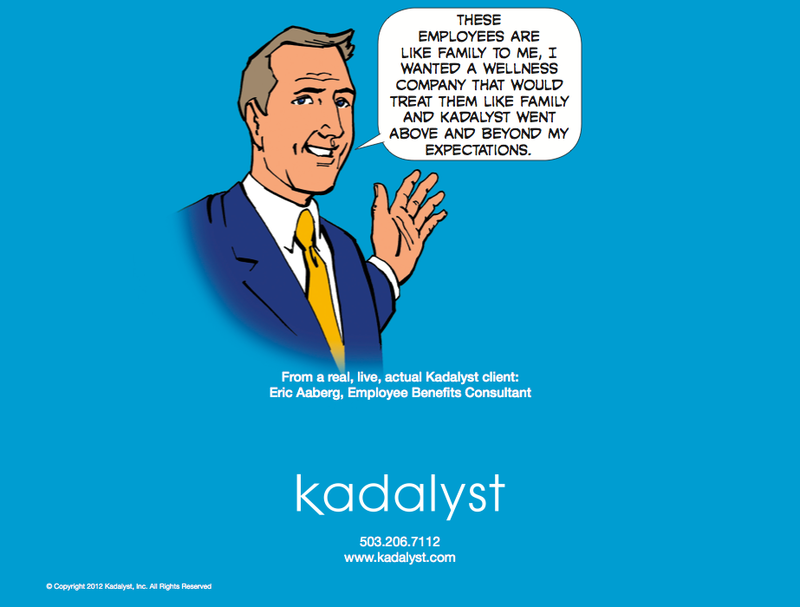 To capture the essence of these innovators and clearly explain the somewhat complex inner-workings of their plan, we developed the Kadalyst Comic Book, which used a clear, punchy storyline to deliver the message of their healthcare revolution. We led with their story and ended with engaging stats. We slipped flashcard-style FAQs into a front pocket and put their client’s caricature next to his testimonial in the back. The system balanced Kadalyst’s need to explain their new approach and present hard data in an easy-to-digest way. To redefine healthcare in the workplace by coming onsite and coordinating services. We envision a world where its easy to be healthy because all healthcare elements work together and come to you. Healthcare upside-down, shaken-up, and coordinated onsite.